Complicated crown-root fractures are uncommon type of dental trauma but usually result in significant esthetic and functional problems to those affected. This case report demonstrates sequential endodontic, restorative, orthodontic, periodontal, and prosthodontic modalities for the conservative management of a complicated crown-root fracture of the maxillary left central incisor in a young patient. After root canal treatment and core buildup, the tooth was extruded using forced orthodontic eruption for 8 weeks and retention for 7 weeks. Zinc phosphate cement acrylic crown was used to preserve esthetics and function during the forced eruption and retention period. Rapid orthodontic extrusion is a conservative procedure to expose subgingival tooth structure. Compared to conventional orthodontic extrusion, a higher force is used for the rapid orthodontic extrusion of traumatized teeth. As a result, coronal migration of tooth-supporting tissues is less pronounced because the rapid movement exceeds their capacity for physiologic adaptation., However, the rapid extrusion will cause stretching of the periodontal fibers and subsequent relapse may happen. Supracrestal fiberotomy and extended retention period have been suggested to reduce relapse. The aim of this paper was to report comprehensive management of a complicated crown-root fracture affecting maxillary left central incisor. A 21-year-old Saudi male patient presented to the clinic with severe sensitivity to cold associated with maxillary incisors. The patient's history revealed that he had sustained a traumatic dental injury the day earlier. The injury occurred as a result of direct fall on the face. No loss of consciousness was reported at the time of injury. The patient visited a nearby private dentist who placed a temporary cervical filling in the maxillary left central incisor (#21) and prescribed painkillers. The sensitivity to cold significantly increased throughout the second day, and the patient was advised to seek specialist dental care. The medical history revealed no systemic diseases. The initial clinical examination showed no bleeding, lacerations, or swelling. The patient had fair oral hygiene with multiple caries in posterior teeth. The orthodontic diagnosis was Class I malocclusion with bilateral posterior crossbite. Tooth #21 had cervical temporary restoration and mobility Grade III. The tooth was very sensitive to air blast, and cold test could not be performed due to extreme discomfort. Saliva and blood-mixed bubbles were notable from the sulcus on digital pressure on the crown [Figure 1]a. A cervical craze line was also detectable in the maxillary left lateral incisor (#22). However, the tooth had only slight tenderness to percussion and minimal cold sensitivity. The adjacent teeth showed no sign of mobility, and electric pulp tests gave positive readings. The radiographic examination showed no apical abnormality [Figure 1]b. The pulpal diagnosis of tooth #21 was symptomatic irreversible pulpitis as a result of “complicated crown-root fracture” while apical diagnosis was normal. Due to the time limitation, emergency appointment focused on relieving patient's primary concerns (mobility and marked sensitivity). Tooth #21 was splinted to adjacent teeth using 0.018 × 0.022 inch stainless steel orthodontic archwire (3MTM Unitek, Monrovia, CA, USA) and composite resin (3MTM ESPETM Filtek Z250, USA) [Figure 2]. Under rubber dam isolation, access to root canal was made through the splinted crown, and pulp extirpation was performed. The root canal was then dried with paper points, dressed with calcium hydroxide paste (UltraCal XS, Ultradent Products, USA). Later, cotton pellet and Cavit® (3MTM ESPETM, USA) were used to close the tooth. The patient was given another appointment after 2 days. At the second appointment, the patient was completely asymptomatic. Treatment options were discussed, and he preferred to go for the forced orthodontic eruption. Informed consent was signed. Under local anesthesia and rubber dam isolation (split-dam technique), the fractured crown was removed [Figure 3]a, [Figure 3]b, [Figure 3]c. Working length was then determined using size 25 K-file and electronic apex locator (Root ZX, J. Morita Mfg. Crop., Kyoto, Japan). Chemomechanical debridement was completed with ProTaper® Universal rotary files (Dentsply Maillefer, Ballaigues, Switzerland) and 2.5% sodium hypochlorite in a 30G side-vented Max-i-Probe® irrigation needle (Dentsply Detrey GmbH, Konstanz, Germany). The master apical file was size F3 ProTaper® Universal. The canal was then obturated with matched size guttapercha cones and AH Plus® sealer (Dentsply Detrey GmbH, Konstanz, Germany) using the continuous wave technique. No backfilling was performed to make the tooth ready for post placement [Figure 3]d. The root canal was sealed with a cotton pellet and Cavit®. Alginate impression (Jeltrate®, Dentsply Sirona, Germany) was taken and sent to the laboratory to fabricate a temporary acrylic crown for tooth #21. The fractured crown was resplinted using orthodontic wire and composite resin; similar to the way done before. At the third appointment, fiber post was prepared and cemented using RelyX™ Fiber Post system and RelyX™ Unicem Self-Adhesive Universal Resin Cement (3M™ ESPE™, USA). Palatal gingivectomy was performed to facilitate composite core buildup (3M™ ESPE™ Filtek Z250, USA) [Figure 3]e. The temporary acrylic crown was adjusted and cemented with zinc phosphate cement (DETREY® Zinc, Dentsply, Germany) [Figure 3]f.
The tooth was extruded orthodontically over an 8-week period. The fixed orthodontic appliance consisted of an archwire of diameter 0.016–0.022 in (3M Unitek, USA) and edgewise brackets with slot 0.022 in (3M Unitek, USA) [Figure 4]a. During the orthodontic extrusion, the patient was seen weekly to monitor tooth eruption and reduce the temporary crown. After the tooth extrusion being judged sufficient, supragingival fiberotomy was performed using size 11 surgical blade. The extruded tooth was retained with the same archwire for 7 weeks to prevent any relapse. 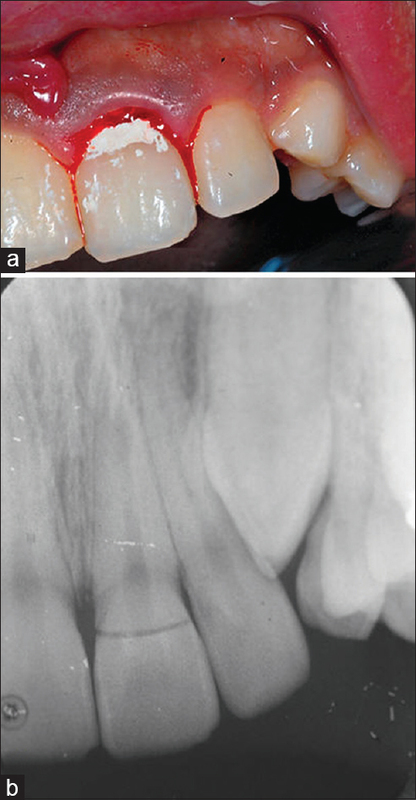 After the retention period, the temporary crown was removed and gingivectomy performed [Figure 4]b. Crown preparation was adjusted, and the final impression was taken with polyvinyl siloxane impression material (3M™ ESPE™, USA). Porcelain fused to metal crown was constructed in the laboratory (IPS Empress®, Ivoclar Vivadent Inc., Schaan, Liechtenstein) and cemented with zinc phosphate cement [Figure 4]c and [Figure 4]d. The first recall appointment was after 9 months [Figure 4]e.
Crown-root fracture is not the most common type of dental trauma, but when it happens, it mostly affects anterior teeth in children and adolescents and can lead to several challenges, with regard to esthetics and management. A combination of endodontic, orthodontic, periodontal, and restorative procedures is usually needed and treatment may extend over several months, which requires a committed and cooperative patient. In the current case, a sub-gingival fracture was located in the palatal aspect of the tooth. The permanent restoration margin should be at least 3–4 mm above the epithelial attachment to provide a ferrule effect and preserve biological width., The ferrule effect is a 360° collar of the crown surrounding the parallel walls of dentin extending coronal to the shoulder of the preparation. The main purpose of the ferrule is to counteract functional stresses on the post-core-root? complex and prevent catastrophic fractures. Lack of adequate supragingival tooth structure may force the restorative dentist to place the crown margin very close to alveolar bone crest, which may result in the future periodontal complications and clinical attachment loss. As the patient, in this case, preferred not to go for extraction, the discussed treatment options focused on placing the fracture line at a clinically adequate supragingival level. Those treatment options included crown lengthening (periodontal surgery); surgical extrusion (intra-alveolar transplantation); and rapid orthodontic extrusion. The crown lengthening option requires removal of supporting bone from adjacent teeth to achieve acceptable soft-tissue esthetics, while surgical extrusion is an invasive technique that may cause complications related to the surgical procedure, root resorption, or postoperative marginal bone loss. Rapid orthodontic extrusion was the least invasive choice of treatment despite its requirement of specific treatment time and an extended retention period. Another disadvantage of this procedure is the occlusal movement of gingival housing during extrusion, which depends on the force and how rapidly the tooth was extruded. The force used in rapid orthodontic extrusion of traumatized teeth is usually around 50–60 g, which is almost double the force used in conventional orthodontic extrusion. As a result, the periodontal fibers stretch and readjust, but bone does not have time to remodel because of the fast movement. Hence, there is no occlusal shift of the marginal bone, and the final restorative treatment will only require gingivectomy without bone reshaping. However, the stretched fibers may exert apical traction force and cause relapse. Therefore, supracrestal fiberotomy of the stretched fibers and extended retention period is recommended., The selection of retention period in this case was based on Simon et al. histological study, which found that periodontal fibers remained stretched for 7 weeks after the forced eruption. One specific factor that determined management, in this case, was patient's request for an esthetically acceptable appearance during treatment because he was a university student. That was a particular challenge due to the relatively long extrusion and retention periods (15 weeks). Splinting the fractured crown during emergency management and after root canal treatment was the best and easiest option. However, maintaining good esthetic during extrusion was far more difficult because an acrylic crown had to be fabricated and used for extrusion. In addition, the patient had to be seen weekly for monitoring and occlusal readjustment following crown extrusion. Therefore, it is very important to carefully assess patient's motivation and commitment during the treatment planning stage of these cases. 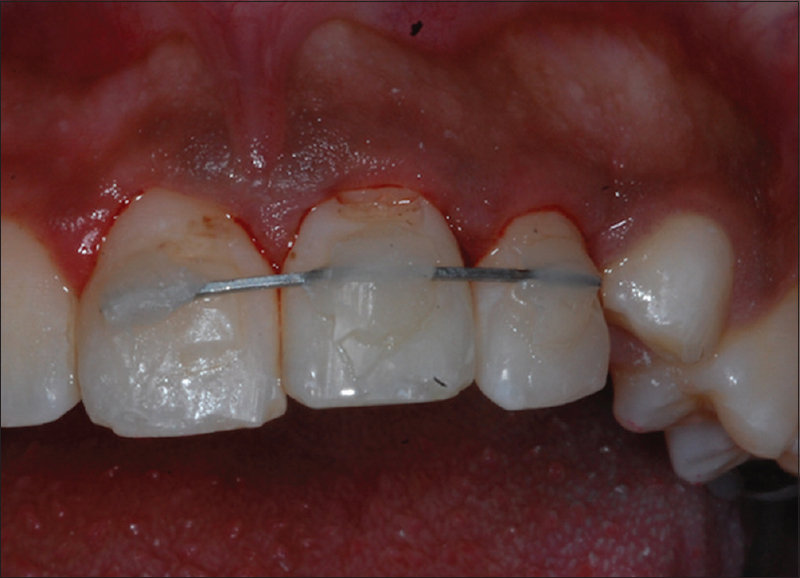 Most of the previous case reports have used either a hook or core-bonded bracket for forced eruption. When Heithersay first described the technique, he utilized a hook attached directly to the post to pull the root vertically toward a horizontal bar using active elastics. Maitin et al. reported a similar technique but used both elastics and archwire for orthodontic extrusion. Other reports had bonded the orthodontic bracket directly to the composite core.,, Mittal et al. utilized a simple device made of two-part wire assembly for extrusion. A wire and loop cemented in the prepared post space was used to move the root vertically toward a horizontal wire with elastics. The ability of such technique to prevent root canal microleakage remains a question. In this case, the use of zinc phosphate cement acrylic crown resulted in good controlled movement with preservation of esthetics during the prolonged treatment and retention periods. It also provided a better coronal seal compared to other treatment options. The temporary crown was easily sectioned and removed during the final treatment stage. This case report demonstrates that complicated crown-root fractures can be predictably and conservatively managed by the forced eruption technique. It should be offered to patients before other options that involve extraction or implant. However, a carefully planned multidisciplinary approach and excellent patient's commitment are essential to the success of this treatment modality. Jackson NG, Waterhouse PJ, Maguire A. Factors affecting treatment outcomes following complicated crown fractures managed in primary and secondary care. Dent Traumatol 2006;22:179-85. Tegsjo U, Valerius-Olsson B, Frykholm A, Olgart K. Clinical evaluation intra-alveolar transplantation of teeth with cervical root fractures. Swed Dent J 1987;11:235-50. Calişkan MK, Türkün M, Gomel M. Surgical extrusion of crown-root-fractured teeth: A clinical review. Int Endod J 1999;32:146-51. Malmgren O, Malmgren B, Frykholm A. Rapid orthodontic extrusion of crown root and cervical root fractured teeth. Endod Dent Traumatol 1991;7:49-54. Sabri R. L'allongement coronaire par l'égression orthodontique. Principes et techniques. J Parodontol 1989;8:197-204. Simon JH, Lythgoe JB, Torabinejad M. Clinical and histologic evaluation of extruded endodontically treated teeth in dogs. Oral Surg Oral Med Oral Pathol 1980;50:361-71. Pontoriero R, Celenza F Jr., Ricci G, Carnevale G. Rapid extrusion with fiber resection: A combined orthodontic-periodontic treatment modality. Int J Periodontics Restorative Dent 1987;7:30-43. Zerman N, Cavallieri G. Traumatic injuries to permanent teeth. Endod Dent Traumatol 1993;9:61-4. Koyuturk AE, Malkoc S. Orthodontic extrusion of subgingivally fractured incisor before restoration. A case report: 3-years follow-up. Dent Traumatol 2005;21:174-8. Sorensen JA, Engelman MJ. Ferrule design and fracture resistance of endodontically treated teeth. J Prosthet Dent 1990;63:529-36. Cooke MS, Scheer B. Extrusion of fractured teeth. The evolution of practical clinical techniques. Br Dent J 1980;149:50-3. Felippe LA, Monteiro Júnior S, Vieira LC, Araujo E. Reestablishing biologic width with forced eruption. Quintessence Int 2003;34:733-8. Arhun N, Arman A, Ungor M, Erkut S. A conservative multidisciplinary approach for improved aesthetic results with traumatised anterior teeth. Br Dent J 2006;201:509-12. 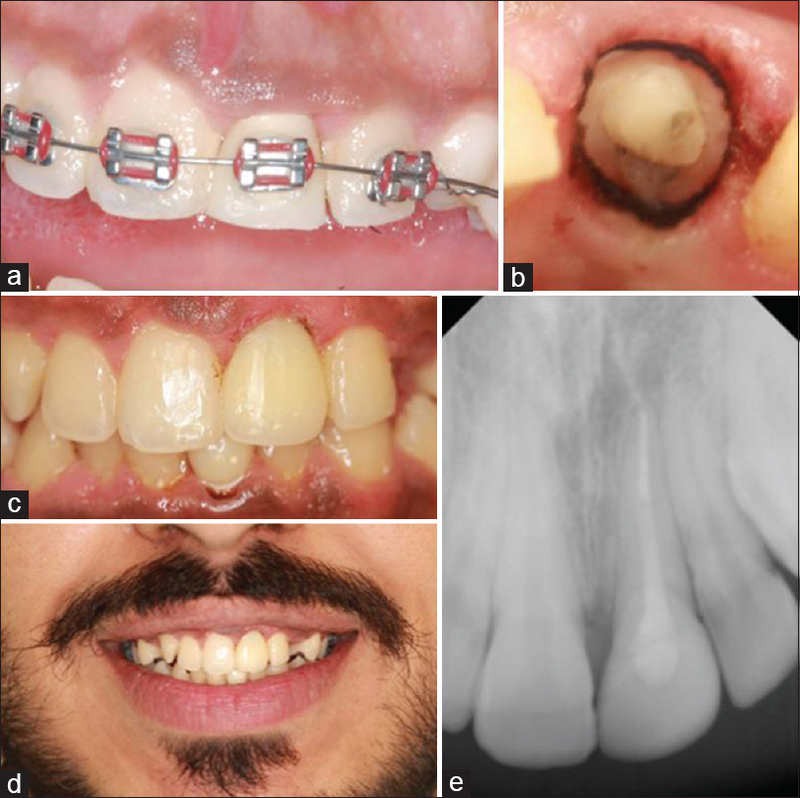 Maitin N, Maitin S, Rastogi K, Bhushan R. Aesthetic management of a complicated crown fracture: A multidisciplinary approach. BMJ Case Rep 2013;2013. pii: bcr2013009643. Yüzügüllü B, Polat O, Ungör M. Multidisciplinary approach to traumatized teeth: A case report. Dent Traumatol 2008;24:e27-30. 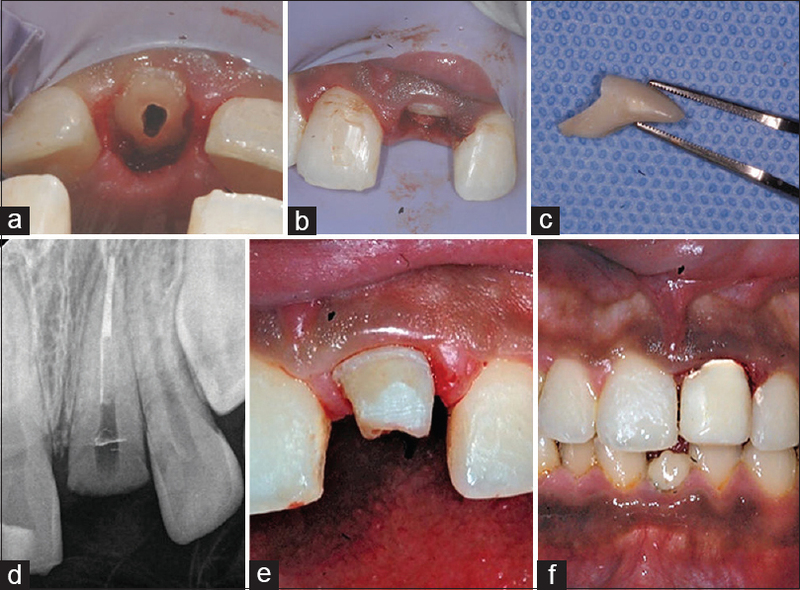 Bate AL, Lerda F. Multidisciplinary approach to the treatment of an oblique crown-root fracture. Dent Traumatol 2010;26:98-104. Milardovic Ortolan S, Strujic M, Aurer A, Viskic J, Bergman L, Mehulic K, et al. Esthetic rehabilitation of complicated crown fractures utilizing rapid orthodontic extrusion and two different restoration modalities. Int J Clin Pediatr Dent 2012;5:64-7.